Trails End | Thoughtcrib, Inc. 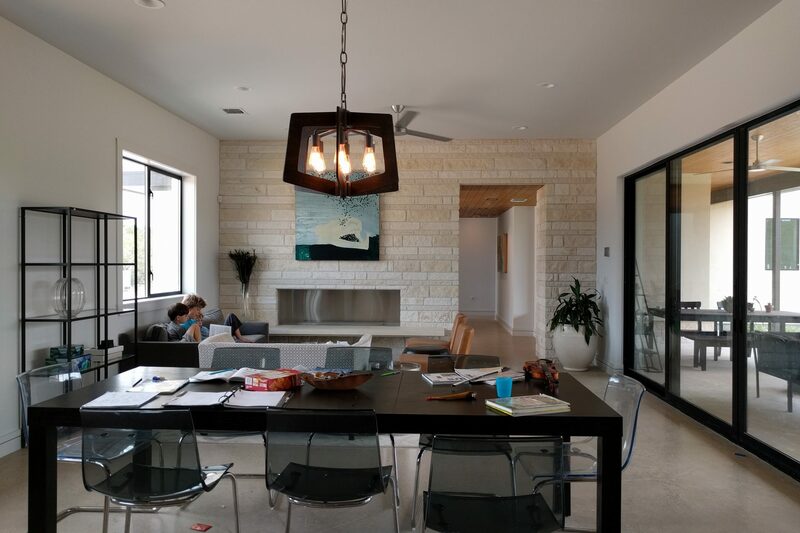 This home was designed for a young family and is well-integrated into its rural site. 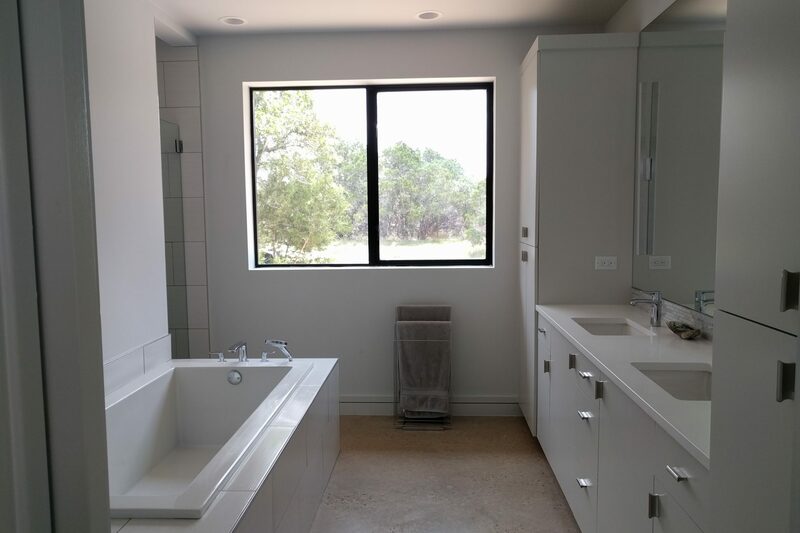 The home is part of a larger rural compound that includes multiple buildings (built or planned) that take advantage of the sloped and wooded site. At 3,250 square feet this gracious family home contains 4 Bedrooms, 4 full Baths, and three Living areas. 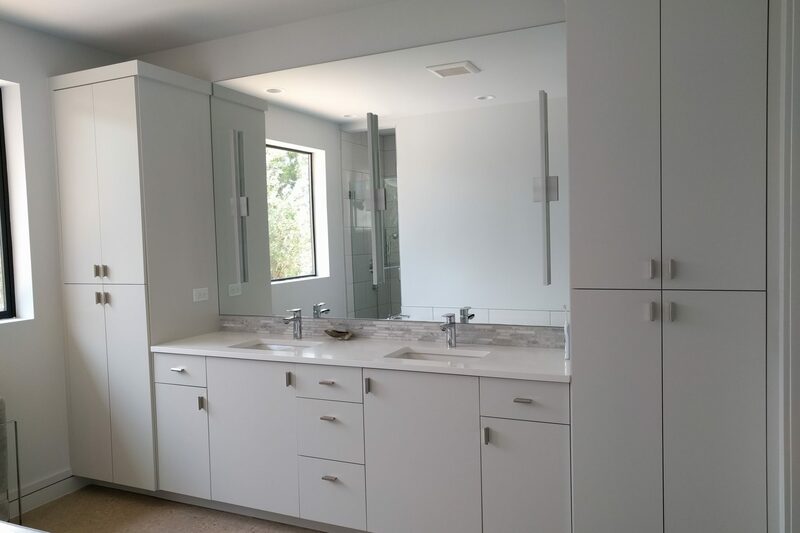 Designed to accommodate multi-generational living, there is a downstairs Guest Suite with a separate entry – which can also be used as a dedicated home office. 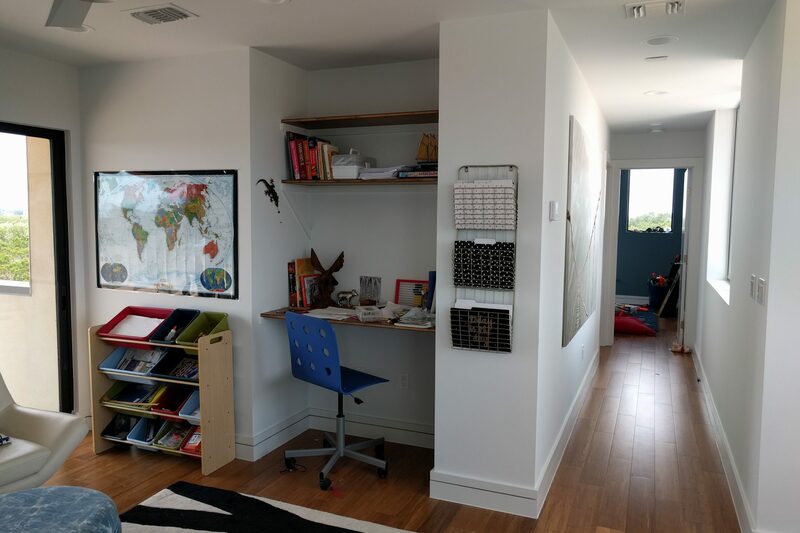 The upstairs kid zone has a dedicated play/office area that can be converted to an additional bedroom in the future. Site: Home placed near bluff with long views to hill country; part of larger rural family compound. 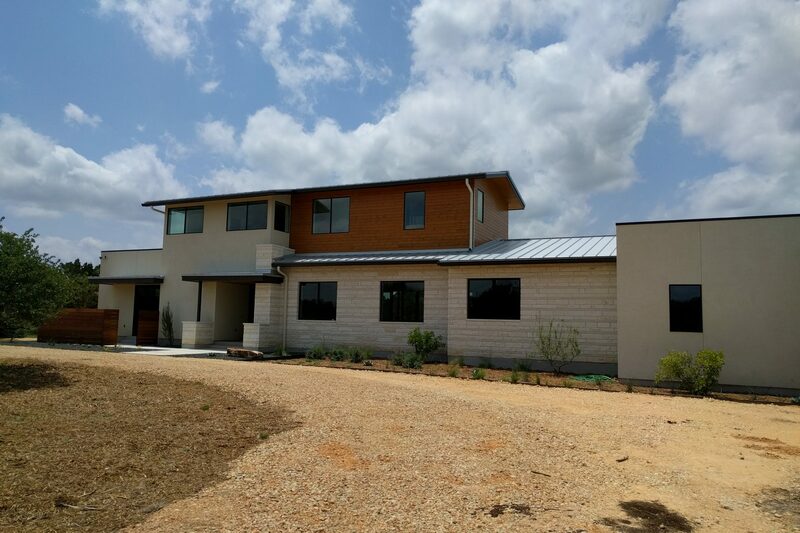 Building Methodology: Conventional wood framing with supplemental steel at porch; Standard-sized building materials minimize waste and costs; Continuous thermal envelope (spray foam insulation + rigid foam outsulation); all mechanical devices are centrally located within the envelope. Thermally broken aluminum windows. 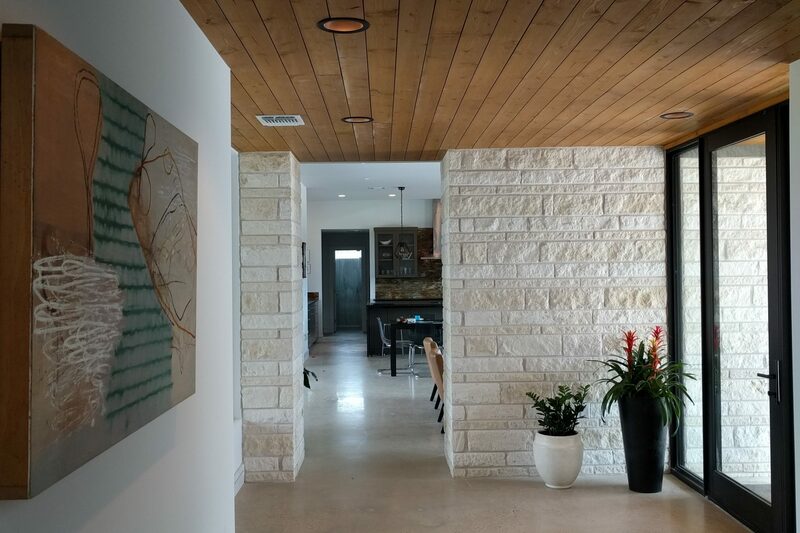 Durability: Exterior stone, stucco, & cementitious siding; stained wood soffits; concrete, tile, and engineered wood floors throughout interiors. 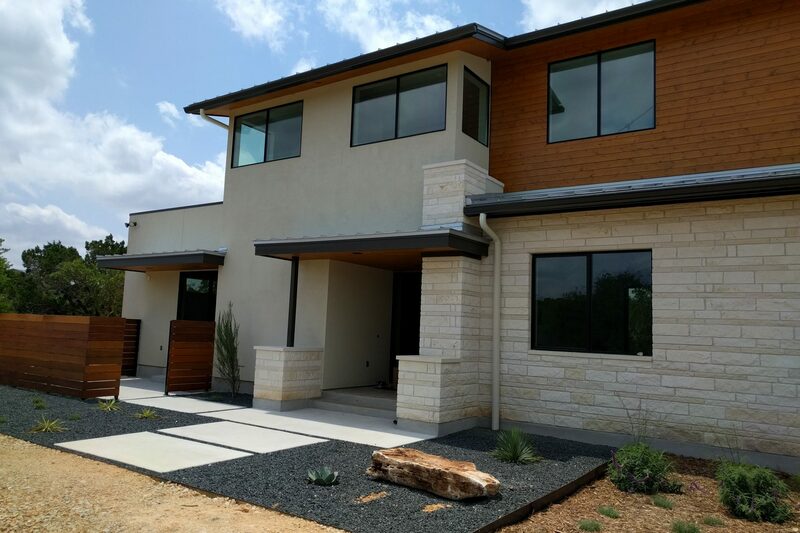 Water strategies: water and wastewater treated on site (no energy used to pump water to or from site); Roof lines simplify rainwater collection and contributes approximately 1600 gallons per inch of rain – all water used in home is rainwater. Low water use plumbing fixtures; heat-pump water heater. Mechanical System: Properly sized, high performance electric heat pump system with sealed ducts located within thermal envelope. Power: Solar-ready home for future solar power generation to offset electrial use; all utilities brought onto site are buried to minimize visual impact.